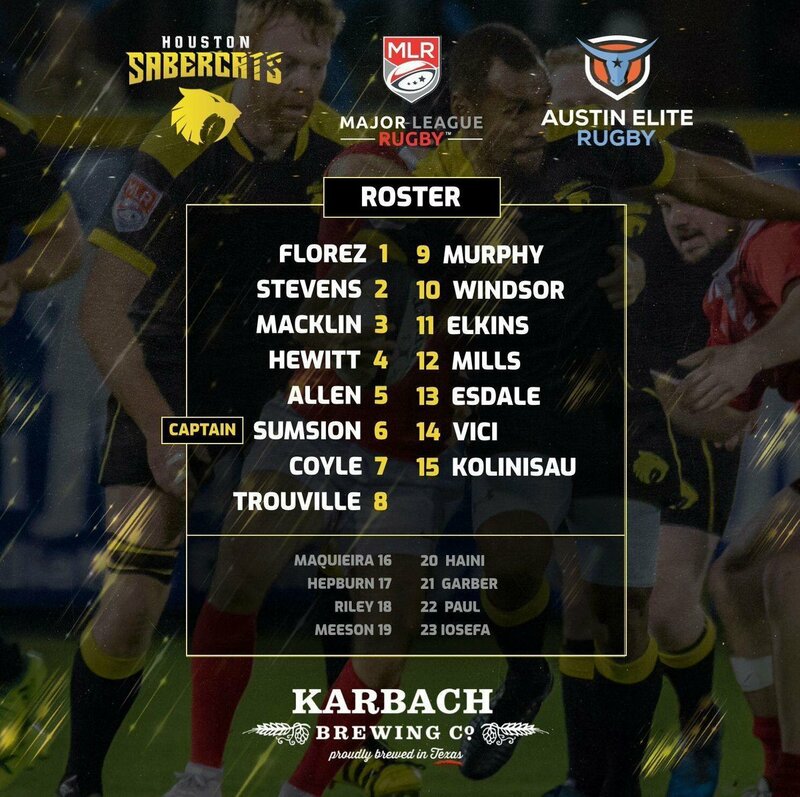 The Houston Sabercats welcomed Austin Elite Rugby to Dyer Stadium. Defense was optional today in Texas. Both teams combined for 13 tries. The fans certainly enjoy the high scoring affairs. The coaches however don't. You can certainly say defense will be on the menu during practice in the next week. The first 10 minutes of the match were not streamed due to technical difficulties. And the Sabercats scored two tries in that time. The Sabercats recovered their own kickoff and Connor Murphy scored from a meter out while Conor Mills notched an assist on the second Sabercats try. Mills was able to break through the Elite defense and offload to Osea Kolinisau for the try. Sam Windsor with the conversion on both. Sam Windsor extended the Sabercats lead to 17 with a penalty kick. After Austin committed a penalty, Windsor took the points on offer to give Houston a little breather. Matt Trouville was shown a yellow card after a no arms, high tackle. Zac Mizell was making a line break and was tackled from behind. Trouville happened to be the next man outside and Mizell fell into his shoulder as Trouville wasn't prepared for him. Austin got on the board with a try from Sione Fangaiuiha that went unconverted. The Trouville yellow card didn't cost the Sabercats that much as they only gave up the one unconverted try. Hanco Germishuys was next on the board for the Elite. Timothée Guillimin spotted some open space behind the Sabercats and made a cross field kick. Hanco then beat Justin Allen to the ball and was able to dot down for the try. At halftime, the Sabercats led 17-10. Some good moments from both teams. Houston played on their front foot for the majority of the first half, but near the end Austin was able to gain a little momentum. Houston made some small mistakes that cost them a bigger lead. The Sabercats started the scoring in the second half quickly. After a missed lineout from Austin, Kyle Sumsion took the loose ball and ran almost to the Elite 22 before he was tackled. Lindsey Stevens rumbled over the line after a quick pass out of the ruck from Connor Murphy. Timothée Guillimin attempted to get some points back on the board for Austin, but his penalty kick was just left. Houston kicked the 22 meter drop out and Austin kicked it right back. Osea Kolinisau caught the Austin kick and stepped around an Austin defender and ran untouched to the try line where he unselfishly offloaded to Josua Vici for the try. Houston continued to step on the gas. Sam Windsor spotted some space and cross kicked ahead to Vici, who offloaded to Justin Allen for the try. Just 10 minutes into the second half, the Sabercats extended their lead to almost 20 points. Sione Fangaiuiha added a second try on the day. He was right there when Ned Hodson went down just short of the line. With no Sabercat defender in front of him, Fangaiuiha took the ball and went over for the try. Timothée Guillimin added another try for Austin. Guillimin made two great line breaks in the lead up to the try, with the second one leading directly to the try. Alex Faison-Donahoe continued the onslaught of tries. After a line break from Sione Fangaiuiha, Faison-Donahoe was there to receive the offload and beat Josua Vici to the corner for the try. Vici was given yellow card at the end of the match for not being back 10 meters after a penalty. Austin added a last minute try to bring the score closer. After forcing a Houston turnover on their own try line, Austin went the length of the field including two kicks ahead and two Houston penalties before Knute O'Donnell added the try for the Elite. Timothée Guillimin added the conversion to bring the final score to 50-38 in favor of Houston. The Sabercats had a good gameplan for this match. They were able to push Austin around during certain parts of the game. They will have to work on playing a complete game. They seem to take lulls during matches and the other team seems to take advantage. Austin will have to get back to the drawing board. They had some things that worked, but they were outworked for the majority of the match. Austin have a short week as they play their first home match of the season. They host NOLA Gold on Thursday May 3rd. Houston has a short week as well, but not as short. They head to San Diego on Friday May 4th for the CBS Sports Game of the Week.